It is with deep sadness that we report the death yesterday afternoon of Professor Emerita of History Norma Basch, who taught at Rutgers University-Newark from 1979 until her retirement in 2004. The publication of her landmark book In The Eyes of the Law: Women, Marriage, and Property in Nineteenth-Century New York, vaunted her to the forefront of the emerging field of women's legal history, a position she continued to occupy throughout her career. Several months before her passing, she signed onto the amicus brief filed by Historians of Marriage and the Family and the American Historical Association and cited in the majority opinion in Obergefell v. Hodges, the Supreme Court case that validated marriage equality. Her major works, both her first book and her second, Framing American Divorce: From the Revolutionary Generation to the Victorians, are listed in the bibliography to the amicus brief and cited in its first footnote, a testament to the abiding impact of her work. A native of Worcester, MA, Professor Basch moved to New York to attend Barnard College, from which she received her B.A. in 1956, and where she met her husband Sheldon, then a student at Columbia. Discouraged as a woman from pursuing graduate studies at that point, she instead devoted herself to her children, Rachel and Fred, not entering graduate school until they were in school, by which time the feminist movement had made advanced studies for women less anomalous. She received her Ph.D. from New York University in 1979, with her dissertation winning the university's Bayrd Still Prize for the best dissertation in history that year. Basch remained a feminist, both personally and professionally, throughout her life, inspiring students, colleagues, and other scholars with the acuity of her insights and analysis and the passion of her commitment. She wrote with unusual clarity and panache, illuminating complex issues in the history of the law with compelling stories of women and men who shaped legal practices and pushed at the law's constraints to accommodate their needs and interests and the intricacies of their remarkable lives. Widely recognized as a leader in her field, Basch held a number of leadership positions in the American Society for Legal History; she served as well on the editorial boards of the Journal of American History and the Journal of the Early Republic. Her work was supported by fellowships from the Woodrow Wilson Foundation, the National Endowment for the Humanities, the American Council of Learned Societies, and the American Antiquarian Society. Three of her articles were awarded prizes, one each from the Organization of American Historians, the Berkshire Conference of Women's Historians, and the Society for Historians of the Early American Republic. Framing American Divorce won the Scribes Book Award, given out annually by the American Society of Writers on Legal Subjects. Basch also served a term as Chair of the Department of History at Rutgers University-Newark, providing outstanding leadership during a period of growth. 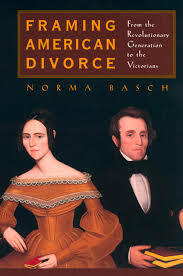 Norma Basch is survived by her husband Sheldon; her daughter Rachel, a novelist; her son Fred, an architect, and his wife Sue; and three grandchildren, all of whom made her enormously proud. Update: A memorial service will be held at 2 p.m., Sunday, October 25, at the Village Temple, 33 E 12th St, New York. There will also be a book at the Studies in Legal History book table at the ASLH meeting, where those who wish to can include their remembrances of Norma and condolences for her family.